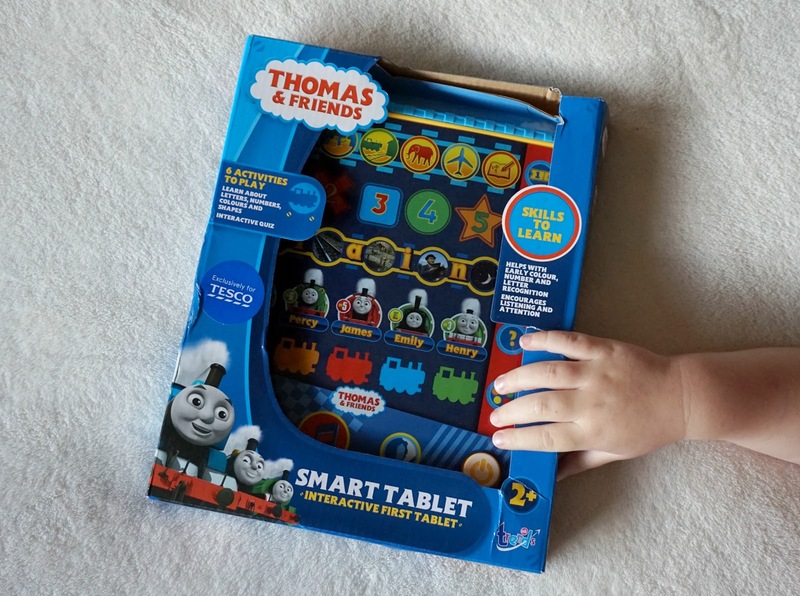 Hello lovelies, Lawson recently received this Thomas and Friends Smart tablet. Lawson is a huge fan of Thomas and friends already so when he received this in the post he was very happy and immediately shouted choo choo! I'll be completely honest in saying I do struggle with Lawson to bring his communication skills on having him and his older brother, Oscar seems to speak a lot for him and I felt I had more time with Oscar when it was just us two where as now I have to juggle my time between them both, it's a bit easier now Oscar is in full time Reception but it can be tough so things like these electronic smart tablet makes the journey a little easier. Even better is I can enjoy a hot coffee whilst Lawson thinks he is just playing with a tablet but in fact he is learning and playing, this is particularly great for colour recognition, sounds, numbers, shapes and more. I have noticed he has been picking colours out a lot better now after just using this tablet for a few days, he is now pointing to things shouting blue which is amazing! 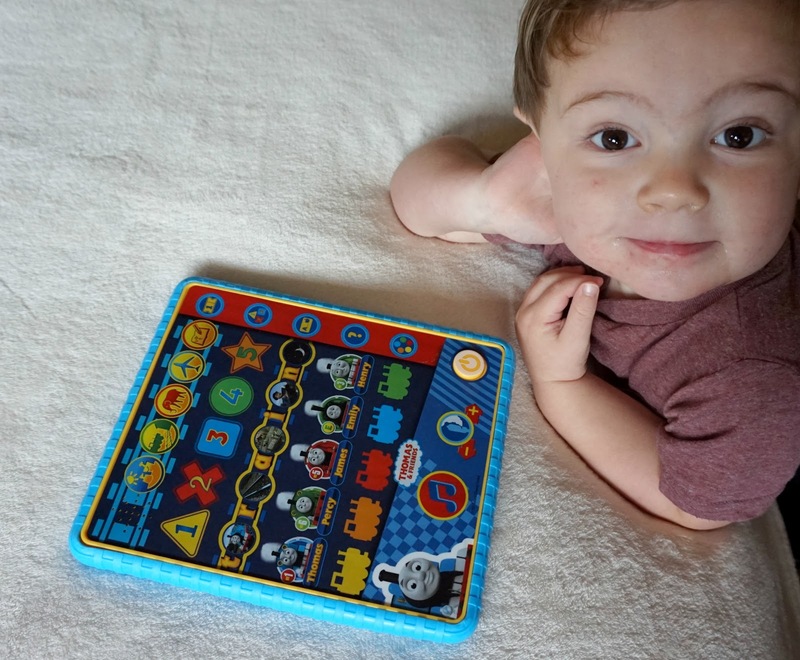 Lawson has just started nursery only doing once a week and as we all know children learn at school but I think its important for them to learn at home too and for them to transition from home learning to school the simple steps like noticing colours, shapes, numbers and sounds can be made easy with this tablet and doing little games at home. This tablet at the side will ask questions like 'what makes this sound' then Lawson just has to choose the right object. It's brightly coloured and a great interactive game for preschoolers to enjoy, children all develop at different times but learning to count and say the alphabet is two important milestones for you to teach your toddler and to help them along their way in school I think electronic tablets are a great toy to help this process and they are having fun all at the same time. Oscar loved toys like this when he was growing up and now enjoys going on my computer now he is old enough and playing learning games on there. 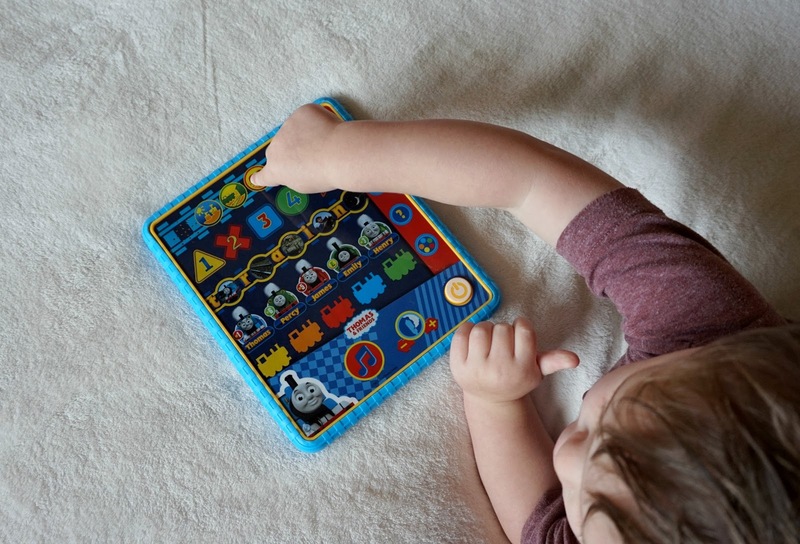 The tablet it self is very easy to use and fun for the children to play with for hours, you can pick one of these up from Amazon.co.uk. Look at that happy little face. Looks like this toy was well received. I sadly can't say I've ever seen it in the shops though. Aww amazing I will look into getting this for my godson, thanks for the share.